You've planned out your Black Friday and Cyber Monday purchases, but have you planned for #GivingTuesday? 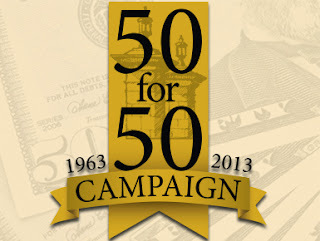 On Dec. 3 we're asking you to donate to the Columbia College Alumni Association's 50 for 50 campaign. If the campaign goal is reached, the newly endowed scholarship will be awarded to two current students. For every $50 received, alumnus Joe Reardon '93 and his wife, Kim, will make a matching donation up to the first $1,000 received. To give, visit ChooseCC.org/50for50 or call (800) 231-2391, ext. 7563. Founded by United Nations Foundation and New York's 92nd Street Y, #GivingTuesday celebrated its inaugural year in 2012 and Columbia College was one of its first participants. The day is "a call to action to celebrate giving and encourage better, smarter and more giving during the holiday season."